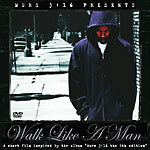 Based on Murs 3:16 the 9th Edition, ''Walk Like A Man'' is a movie about two aspiring hip hop artists, Murray (Murs) and Pete (Damien Wigfall), and their quest to remain inspired musicians while enduring their uninspiring day jobs. When an altercation claims the life of Pete, Murray is faced with the question of avenging his death via the streets or the music. The DVD also includes a behind the scenes featurette, Murs' personal audio commentary, and the Murs videos ''Bad Man'', ''Hustle'', and ''Risky Bizness.'' The CD/soundtrack includes new, exclusive songs from Atmosphere, Brother Ali, Blueprint and I Self Divine. It also has the ''Hustle'' remix which features John Cena (WWE World Champion), Chingo Bling (El Primero Ghetto Vaquero), and E-40 (the Ballitician).